1Click the Manage link in navigation bar of your network's main page. 2Click the Feature Controls link. The Feature Controls page appears. At the bottom of this page, you have three options to control how much or how little your members can do on their profile page. All three are selected by default. 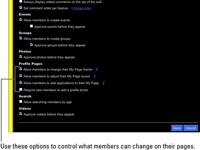 3If you want to make the option Allow Members to Change Their My Page Theme unavailable to members, deselect that option. If you leave it selected, this option allows your members to customize the appearance of their My Page. 4Deselect Allow Members to Adjust Their My Page Layout to make all the profile pages look the same. If you leave this option selected, your members can move features on their My Page. 5Deselect Allow Members to Add Applications to Their My Page if you want to remove all OpenSocial applications from your members’ profile pages. If you leave this check box selected, your members can add OpenSocial applications to their profile page.